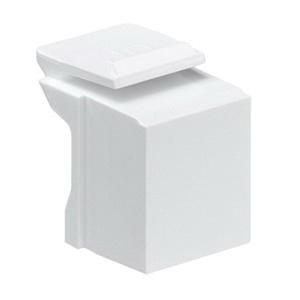 Leviton QuickPort® Blank insert in white color, is suitable for use with QuickPort® wallplates and housings. It measures 0.58-Inch x 0.79-Inch x 0.64-Inch. This blank insert featuring plastic construction supports flush and surface mounting. It secures unused QuickPort® openings and provides protection from dust as well as debris. Blank insert is cULus listed.